Many of our pollinators such as bees and butterflies have been in decline due to multiple reasons. 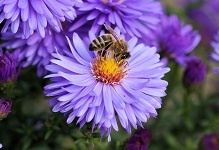 Eighty-seven percent of all flowering plants depend on pollinators for their reproduction. This includes 35% of the world's food crops. Come learn about what you can do in your gardens to help provide habitat and protect our local pollinators. This talk was written and will be presented by Mindy Habecker, UW Extension Natural Resource/Community Development Educator in Dane County, Wisconsin. She was a member of the county's Pollinator Protection Task Force and now works with Dane County Environmental Council to realize the Task Force's goals.